You will need the following installed on your machine: Xcode, the Laravel CLI, SQLite and Cocoapods. Familiarity with the Xcode IDE will be helpful. You should have completed part one of the series. In the first part of this article, we started developing our cryptocurrency alert application. We developed the backend of the application that will power the iOS application. As it stands, our backend application can return settings for a device based on its UUID, save the settings for a device based on its UUID and also it can figure out what devices to send push notifications to when the currencies update. In this part, we will focus on creating the iOS application using Swift and Xcode. Completed the part one of this article. We already started out by building the backend of the application using Laravel. So next, we will build the iOS application using Swift. If you want to test the push notifications then you will need to run the application on a live device. 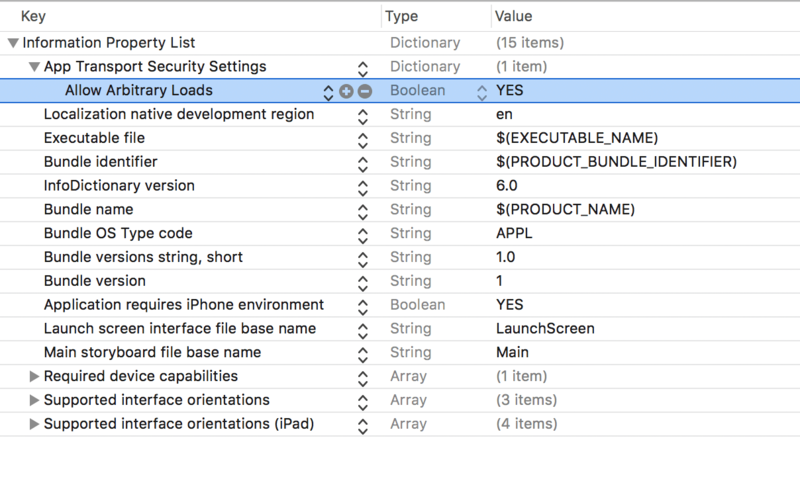 Launch Xcode and click Create a new Xcode project. Select Single View App and click Next. Enter your Product Name, we will call our project cryptoalat, and select Swift from the Language options. You can also change any other detail you wish to on the screen then click Next. If you used a project name other than cryptoalat, then change it in the Podfile to match your project’s target name. When the installation is complete, you will have a *.xcworkspace file in the root of your project. Open this file in Xcode and let’s start developing our cryptocurrency alert application. The first thing we need to do is design our storyboard for the application. This is what we want the storyboard to look like when we are done. Open the Main.storyboard file and design as seen above. Above we have three scenes. The first scene, which is the entry point, is the launch scene. We then draw a manual segue with an identifier called Main. Then we set the segue Kind to Present Modally. This will present the next scene which is a navigation view controller. 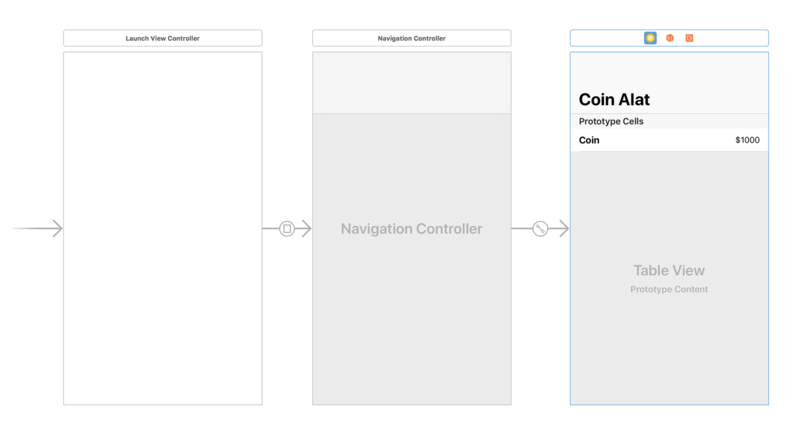 Navigation controllers already have an attached root view controller by default. We will use this attached view controller, which is a TableViewController, as the main view for our application. It’ll list the available currencies and show us a text field that allows us to change the setting for that currency when it is tapped. On the third scene, we set the reuse identifier of the cells to coin and we drag two labels to the prototype cell. The first label will be for the coin name and the second label will be for the price. Now that we have the scenes, let’s create some controllers and view classes and connect them to our storyboard scenes. Set the controller as the custom class for the first scene in the Main.storyboard file. In the code, we load the settings using a SettingsService class we will create later. When the settings are loaded for the device, we then call the routeToMainController method, which routes the application to the main controller using the Main segue we created earlier. The next controller we will be creating will be the CoinsTableViewController. This will be the controller that will be tied to the third scene which is the main scene. cell.name.text = "1 \(coin.name) ="
Above we have defined the Coin struct and it has a name and rate property. We have the controller which we define the coins property as an array of Coins. We then have some boilerplate code that comes with creating a table view controller. The numberOfSections method specifies how many sections the table will have. In the first tableView method, we return the number of coins available and in the second tableView method, we define how we want each row to be handled. If you noticed in the code above, we referenced a CoinTableViewCell as the class for each row in the last tableView method. Let’s create that. @IBOutlet weak var amount: UILabel! Open the Main.storyboard file and set the class as the custom class for the prototype cell in the third scene of the Main.storyboard file. When you have set the class, connect the @IBOutlets as specified in the cell class above. The next class we need to create is the SettingsService. This class will be responsible for updating and fetching the settings for the device. static let key = "CryptoAlat"
Above we have the SettingsService. The first method loadSettings loads the settings from the API and then saves it locally. If there is no setting remotely, it calls the defaultSettings method and saves the response to the API. The saveSettings method saves the Settings remotely using updateRemoteSettings and then locally using updateCachedSettings. The fetchRemoteSettings gets the settings from the API and decodes the response using the Swift decodable API. Above we have a simple Settings struct that conforms to Codable. We also have a toParams method that converts the properties to a Parameters type so we can use it with Alamofire when making requests. One last class we need to create is AppConstants. We will use this class to keep all the data that we expect to remain constant and unchanged throughout the lifetime of the application. static let API_URL = "http://127.0.0.1:8000/api/settings"
static let PUSHER_INSTANCE_ID = "PUSHER_BEAMS_INSTANCE_ID"
static let PUSHER_APP_KEY = "PUSHER_APP_KEY"
static let PUSHER_APP_CLUSTER = "PUSHER_APP_CLUSTER"
Replace the PUSHER_* keys with the values gotten from the Pusher Channels and Beams dashboard. Now that we have defined the settings service, let’s update our controller so the user can set the minimum and maximum prices for each currency. let title = "Manage \(coin.name) alerts"
let message = "Notification will be sent to you when price exceeds or goes below minimum and maximum price. Set to zero to turn off notification." textfield.placeholder = "Alert when price is below"
textfield.placeholder = "Alert when price is above"
var btcMin: Int?, btcMax: Int?, ethMin: Int?, ethMax: Int? The method above is automatically called when a row is selected. In this method, we display a UIAlertController with two text fields for the minimum price and the maximum price. When the prices are submitted, the SettingsService we created earlier takes care of updating the values both locally and remotely. In the code above, we are using the Pusher Swift SDK to subscribe to our currency-update Pusher Channel. We then subscribe to the currency.updated event on that channel. Whenever that event is triggered, we refresh the price of the cryptocurrency in realtime. In the class above, we use the Pusher Beams Swift SDK to register the device for push notifications. We then subscribe to the *_eth_changed and *_btc_changed interests, where * is the device’s unique UUID. Now that we have completed the logic for the application, let’s enable push notifications on the application in Xcode. This will create an entitlements file in the root of your project. With that, you have provisioned your application to fully receive push notifications. That’s all. We can run our application. However, remember that to demo the push notifications, you will need an actual iOS device as simulators cannot receive push notifications. If you are using a physical device, you’ll need to expose your local API using Ngrok and then change the API_URL In AppConstants. In this article, we have been able to see how easy it is to create a cryptocurrency alert website using Laravel, Swift, Pusher Channels and Pusher Beams. The source code to the application built in this article is available on GitHub.